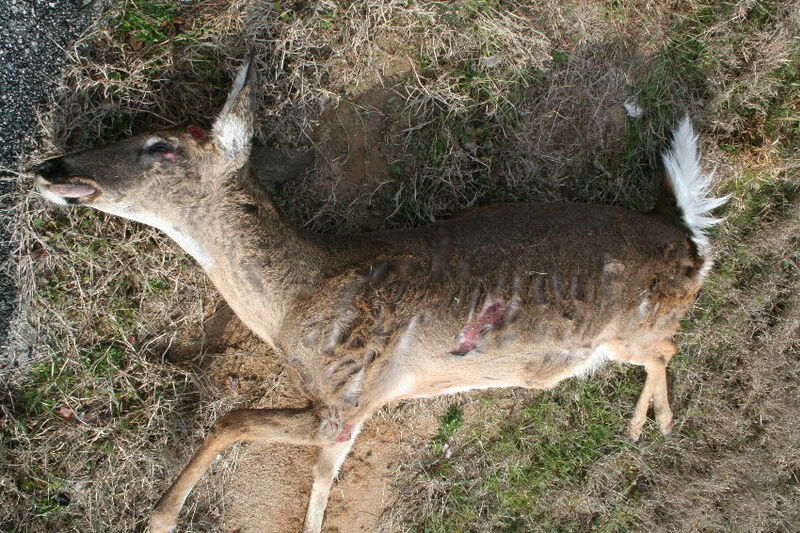 A typical road-killed deer. Some will have more damage, some less; but this is about average. Two new videos, one on cleaning a road-killed deer and the other on swan hunting, have been done; but both files are too large to post. The road-killed deer video is about 30-minutes long and the one on swan hunting is about 15 minutes. I did not edit the road-kill video so that the viewer would have an accurate and realistic view of a 68-year-old guy (me) sometimes struggling to skin and gut a road-killed deer by himself. Everything is there but the smell, and I describe that as best I can. The reason I did this is to show that salvaging a road-killed animal requires considerable effort. By the time a person has done everything necessary to gather, skin and clean that deer; I feel he (or she) has earned the right to keep it – despite some states’ laws to the contrary. Should anyone want a one-off copy to help convince state legislators to change their laws on utalization of road-killed animals, I will produce and mail a copy for $25.00. In my opinion anyone who goes through this much trouble to salvage meat from a dead animal lying beside the road and accepts any risk of feeding it to their families should be allowed to do so. In times when unemployment is high and people are going to bed hungry there is no reason not to utilize the meat from a dead animal found beside the road. From a health point of view, there is no practical difference between salvaging a road kill and a hunter cleaning a gut-shot animal. The meat, bones and organs that I cannot use are often boiled for my pets. What is left is put in an open field for the buzzards. Send the request and payment to Whitehall Press – Budget Publications, 1325 Jordan Mill Pond Rd., Sandersville, GA 31082. 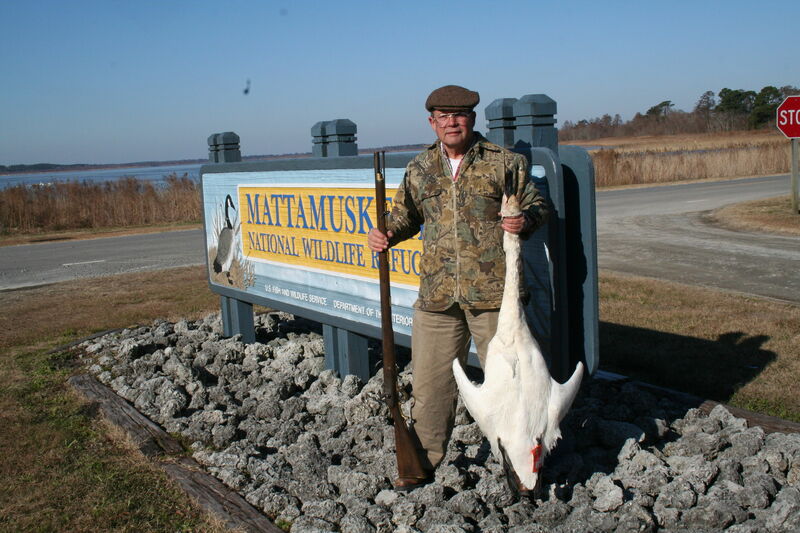 Swan from a January, 2010 hunt at Lake Mattamuskeet, NC taken with an original 1842 British musket and load of non-toxic shot. I will make another attempt to reduce the photo sizes on the Swan video to get something up for those who are interested. I will also post some photos on Flickr when they are ready. A video on my blog, http://www.hoveysmith.wordpress.com , (look back in the archived sections) has a narriated slide show on using road-killed deer, and my book, Backyard Deer Hunting: Converting deer to dinner for pennies per pound ($19.95) pictures and describes the processes of retrieving, cleaning and long-term storage of road-killed deer. Hiya, nice day! Your post is incredibly striking. I never believed that it was possible to do something like that until after I looked over your write-up. You undoubtedly offered an excellent understanding on exactly how this whole process operates. I will always come back for more tips. Keep it up! I will have more interesting stuff to post soon about not only about using road-killed deer, but also how to make use of reptiles that drop from the sky. I do not know where you live, but look at your state’s regulations on using road-killed animals and do what you can to convince state legislators to remove any troublesome restrictions. Hi, is this a custom theme or can it be downloaded for free? Thanks. You know this is not easy to find. This is a great post. I am glad you enjoyed it and found it useful. There is more detail in my book “Backyard Deer Hunting: Converting deer to dinner for pennies per pound” as well as information on how to handle wild hogs, bear, larger game animal, turkey, large fowl and small game. Please recommend this book to your local library. It is now out in softcover and as an E-book and will soon be out in hardcover. Glad to have you. Drop in again sometimes. I will always have something interesting, and not what you might expect. I noted that some comments are showing up in my “Spam” file on this blog while others are not. I cannot say why. Either way, they are reaching me and will be responded to. I try to provide postings and info that a variety of people will find interesting. Not every post will, or can, fill every reader’s interest. However, I will revisit the topics of inexpensive outdoor eats, useful hunting tools, interesting hunting trips, marketing, human relations in the outdoors and philosophy from time to time. Most of these themes are somehow brought into my books. This is just the way my mind works. Genetics will not allow me to do otherwise, or at least not for long. Soon I will start a blog on my creative-writing projects including my new Christmas Story, Play, Screen Play, and CD, “A Visit from Auntie Thresa Clause.” Some illustrations are nearly ready to post and these are striking. They are being drawn by a local firm in Harrison, GA – a tiny, depressed rural town. Talent is where you find it, and often closer than you think. Did you find my videos on deer cleaning and cooking? I did not notice that any were hit. I also have other posts on cooking deer stew, deer liver, squirrels, swan and other things. There is much more in my book, Backyard Deer Hunting. You can order it through Amazon.com and has also been picked up by distributors in England, other European countries as well as in India.